God made Him who had no sin to be sin for us so that we might be the righteousness of God. Love that. What a glorious thought! It was a great way to start my day. Then Brian and I got in an argument over something stupid. I snapped, he snapped… you know how it goes. And before I knew it, I went from being clothed in the righteousness of God to my same old sinful self. And I’ve been fighting a bad mood all morning thinking of how quickly the conversion from Spirit-filled to self-filled happens. It’s heart-breaking. Brian and I are supposed to go out to dinner this evening, and Grandma Beverly is keeping the kids. And instead of looking forward to it, I’m finding excuses that we’ve got too much to do, that we won’t be in the mood to appreciate it. And the enemy is loving it. He’s watching and loving the fact that he snuck into my Spirit-filled morning and found a weakness. And now he’s doing everything he can to use the splinter of the morning’s argument to pull us apart. There’s nothing he’d like more than to see the God’s sacred union of marriage be weakened. The little splinters add up, and before you know it, the enemy is rejoicing at the rift he’s caused. Slaves are to be submissive to their own masters in everything; they are to be well-pleasing, not argumentative, not pilfering, but showing all good faith,so that in everything they may adorn the doctrine of God our Savior. It was a great message, but for much of it, I felt like it wasn’t relevant to me. I’m not employed*. I’m lucky enough to stay at home with my kids. I don’t have an employer. So I listened, but didn’t really notice much application. Until I thought about my “job”. I do have a job… to love, encourage, inspire and grow my children. I get to do it full-time and not juggle another job. And when I thought about my job, I realized… God has called me to this position, this “full-time job”. He is my employer. And WHAM… the whole message was suddenly very much directed at me. I’m not going to do it justice in my summary, I’m sure. But Pastor Chris spoke of attitudes at work, gossip, “stealing” including time, obedience but especially obedience with the right attitude. And when I thought of my “job” as a full-time mom and these things, I realized that often I haven’t lived out these verses in serving God as my master (employer). I haven’t always had a good attitude, I’ve wasted my time in countless ways, I’ve grumbled about many of the “hours” I work. What a calling… what a privilege! God’s allowing me to serve him full-time in the “job” a mother’s heart is created to do. I have amazing children who I get to help “grow in stature and favor with God and with man” (Luke 2:52). There are a million things vying for my attention, but I need to keep my Employer and the job He’s called me to at the forefront of my mind. 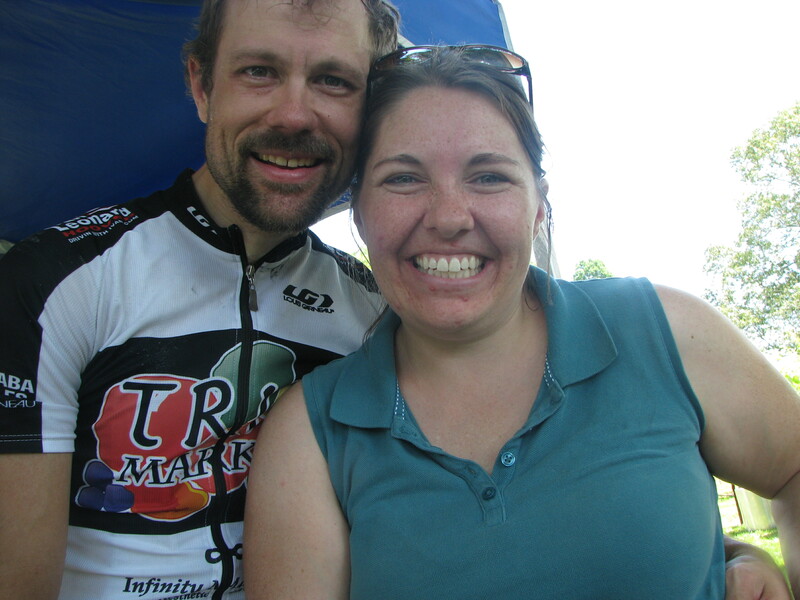 We just got back from an anniversary/bike race weekend… the first time in 6 years that we’ve had any time to enjoy our special day together! It was lovely… right down to the chocolate mousse cheesecake we shared in memory of my our wedding cake. (Thanks, again, to Dena for being the cake courier!) My computer battery is dying, and bedtime is nearing, but I can’t let this day pass without saying how blessed I am. Amazing memories from June 28th, 2003… rain most of the day, but it didn’t dampen our spirits; meeting Brian for a quiet few moments and prayer before the pre-ceremony photos; praying separately with our respective wedding party members before the ceremony; a ceremony that we still talk about as “perfect” with awesome music; surprising my sweet husband with a song during the ceremony; our first sweet kiss; a fun reception with delicious food; clouds of mosquitoes as we attempted a few outdoor photos; driving away with little gold hearts blowing out our air vents (there are a few still hiding in there! We are determined that we’ll be newlyweds as long as we can see them reflecting in the front window! ), sharing the day with the most special people in our lives. If you were there… thank you! And we probably talked about you today 🙂 So much has happened in these awesome 6 years, and we’re so very thankful and excited to see what God has in store for the future. And Brian… I love you so very much. I’m so glad you found me in Texas nearly 8 years ago! You are my dearest friend, and I’m so happy to share this life with you. I’ll always be your #1 fan! Photo courtesy of Analise at a bike race earlier in June. A few weeks ago at church, we sang a worship song with the phrase “my life is a love song to you”. I started to think about what that would look like… if I was really living my life as a love song to the Lord. What is a love song? It’s sweet, poignant, tender. The chords blend together perfectly, harmonies lifting up the melody. A love song touches your heart, and it gives you a beautiful picture of the loving relationship it describes. From day to day, I’m not sure I could say my life is a love song. But over the past few weeks, I’ve been listening to the “chords” of my life, trying to turn them into beautiful melodies for my Savior. Some days, the harmonies are off, and no one would recognize a love song in the clashing tones. Most notably, I’ve struggled with Grumpy Mom Syndrome. Whining kids, interrupted sleep, too much on my plate, and not prioritizing things well are all contributing factors. I’ve spent a little more time filling up my heart with God’s word in the morning (or in the carpool line!). I’m thinking of expressing my love more as I deal with grumpy kids and frequent messes. My actions to them are a love song… and it’s speaking to their hearts as well as mine.